Standley Feed proudly stocks Trapp Candles. At Trapp, it’s all about the fragrance. That’s why they guarantee every product will fill a room with fragrance within minutes, or they’ll replace it…even a votive. 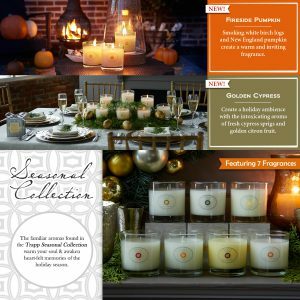 The Trapp candle line was founded in Kansas City, Mo., in the early 1990s by interior and floral designer Bob Trapp. Trapp ran the wholesale business out of the basement of his store on 4110 Main Street until he sold the brand to his friends at the Faultless Starch/ Bon Ami Company, which is a fifth generation family-owned company headquartered in Kansas City. Once you light these around your home, you’ll see why these candles are a favorite. These make great gifts for all occasions and with Mother’s Day coming up, you’ll be confident that mom will love this gift!